Cooking in a charity kitchen takes energy, a calm head and a healthy dose of culinary creativity. Claire Fraser, volunteer chef at Greenwich Migrant Hub, has all three in bounds. 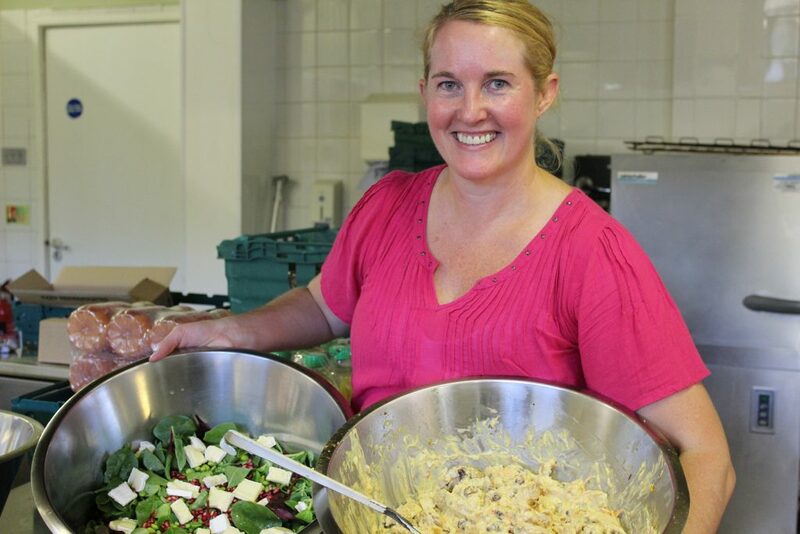 We caught up with Claire to find out how she transforms surplus food from FareShare into magnificent meals every week. 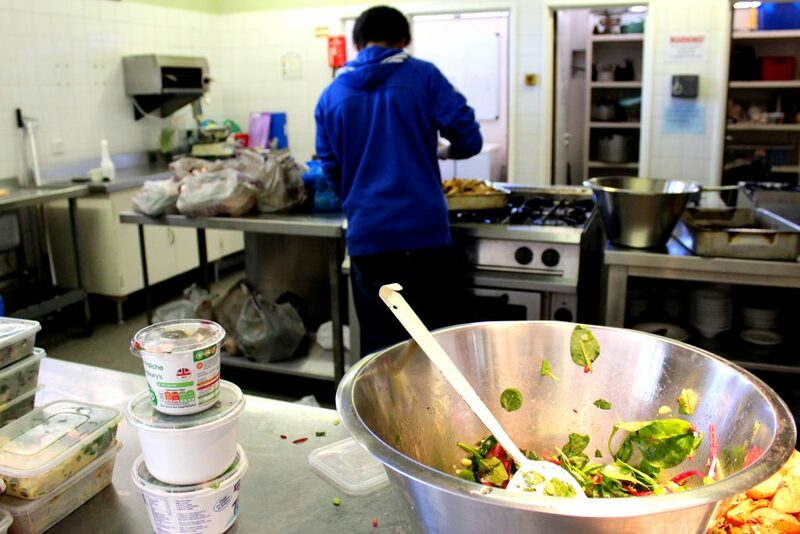 The meals are a lifeline to the many asylum seekers and refugees who use the Hub’s support services. 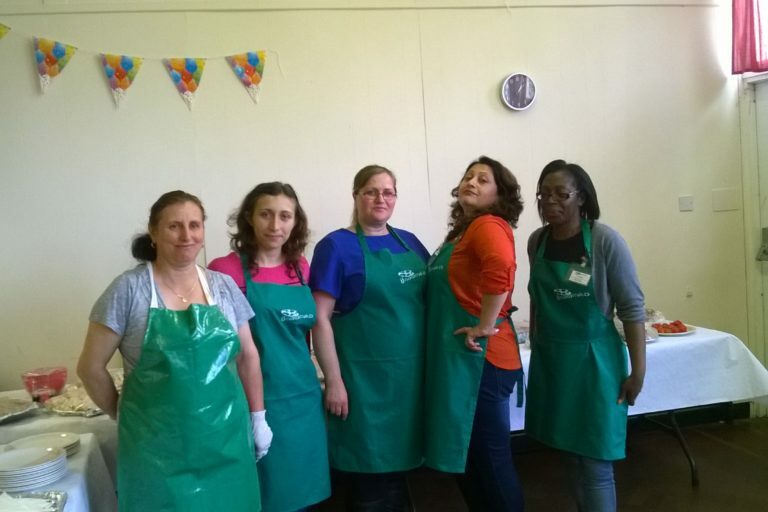 Claire, volunteer chef at Greenwich Migrant Hub. 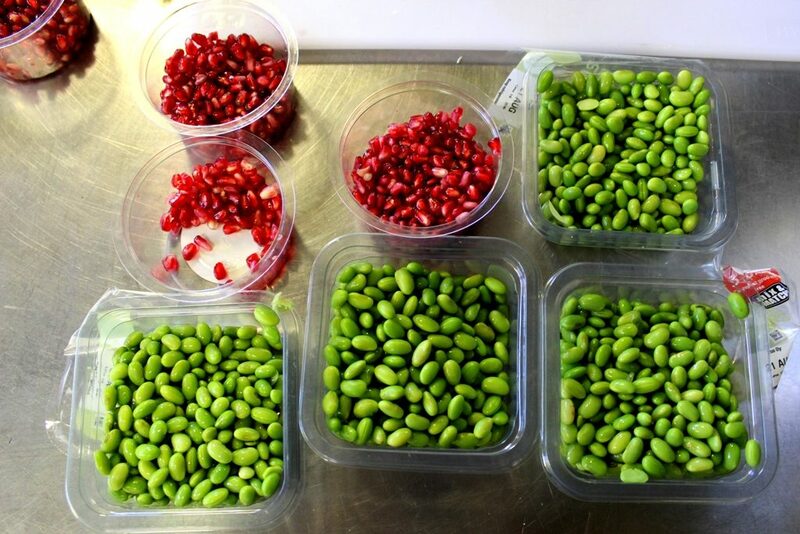 I’m using our FareShare delivery to make a salad of spinach leaves with edamame beans, pomegranate and Camembert to be served alongside potato wedges with tomatoes and red pepper and coronation chicken. I always try to cook from scratch and make something that’s going to be nutritious. A lot of our clients don’t have great cooking facilities so we try and make sure that what we’re doing here is good food. We run an advice centre once a week to help people without recourse to public funds. It might be people who have been trafficked into the country, asylum seekers waiting for their status to go through or people who arrived in the UK on a spouse’s visa and their marriage has broken down. We have a lot of people escaping abusive relationships. When people arrive one of our advocacy volunteers listens to their story. We then book them in to see one of our specialists, who might give immigration and housing advice or domestic abuse support. Where does the food come in? A lot of people are living on the breadline so there’s no doubt that the lunch we serve and the food parcels we give out really do help. They are very gratefully received. People are coming here to have some really horrible discussions so we try to make it a warm and relaxed space. Everyone sits around a big table and eats lunch together while they’re waiting to see an advisor. The table becomes the heart of the community. Lots of people are quite isolated so it’s good to be able to chat to other people who are in the same situation. How do you plan what to make with your weekly FareShare delivery? Our delivery arrives on a Friday and I’ll then have a think about what I’m going to make the next Tuesday. To me it’s really important to not just make a baked potato every week. Just because you don’t have a lot in life doesn’t mean you shouldn’t be treated as if you have. Good food makes people feel valued. We all deserve more than the basics. 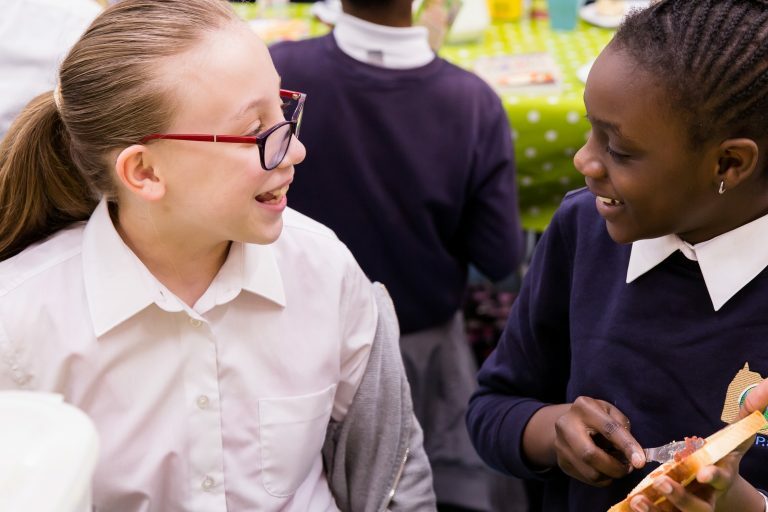 What difference does using food from FareShare make? It means we can afford to make proper meals and saves us about £60-70 a week. That money helps us to continue to run the project as it helps fund our two paid staff. Most unusual food you’ve received from FareShare? I’m going to change the question slightly – instead I’d say the most appreciated food we get is the fruit. It is a real luxury to a lot of our clients. One woman was so excited when she saw we had watermelon from FareShare as it’s her son’s favourite thing but she can never justify spending money on it. 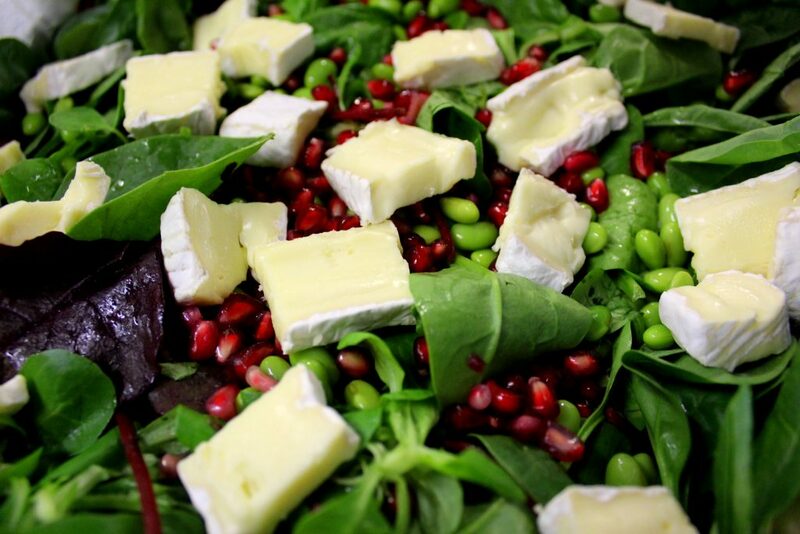 Claire transforms the surplus ingredients into a super food salad. You have lots of ideas when it comes to creating recipes, do you have a culinary background? I used to run my own catering business but more recently worked in marketing in the City. I also volunteer with Crisis at Christmas and help to plan and manage their meal provision. It’s good to give something back. It reminds you that that are a lot people whose lives are tougher than yours and it’s not because they have done something wrong. I could just as easily have been in a bad situation. People are only a step away from poverty. And what’s your personal favourite food? Slow cooking on a BBQ. Though I don’t get much chance to do that here! After lunch has been eaten, leftovers boxed up and food parcels given out, the clear up begins. 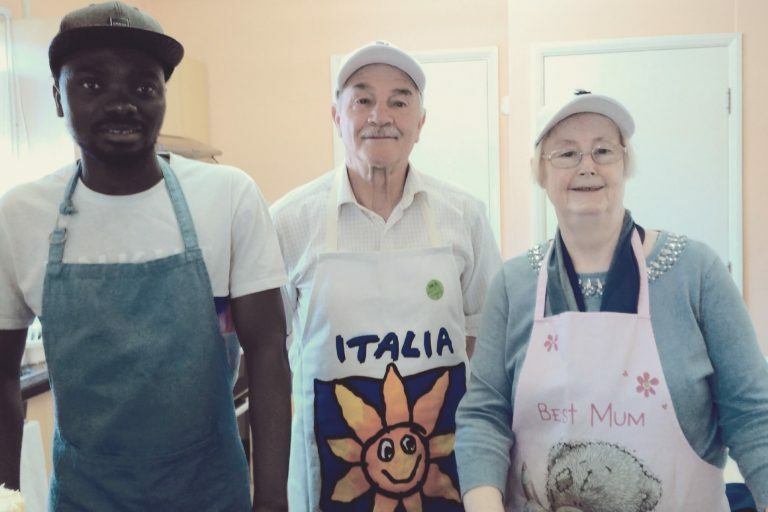 A good meal and a warm welcome meets everyone who arrives at Brushstrokes, a charity supporting asylum seekers, refugees and the most vulnerable people in the Sandwell area of Birmingham. Within a week of opening, The Cosy Crow Cafe had already gained regular customers. Their ‘pay as you feel’ meals – made using surplus food from FareShare North East – proved a big hit with the older community in Gateshead.